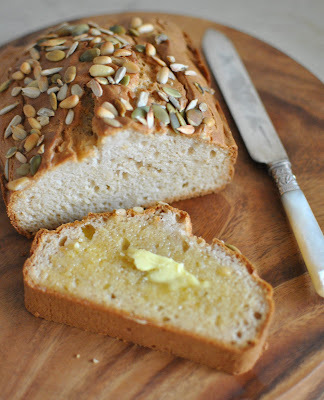 Hands up those who still think gluten free bread is tasteless and boring? Or was I the only one? The newly enforced trial diet for my partner has meant me venturing in to the world of gluten free baking, and I must admit I have learnt a lot during the past few weeks! This simple bread recipe was my first bread baking experiment after trying a couple of delicious flourless cake recipes. I had thought the end result would be, as I suggested, boring and tasteless, but turned out I couldn't have been more wrong. I have always loved baking bread, and I am so glad to know there are delicious gluten free bread recipes out there. This is a must try for everyone! Preheat oven to 180C and grease a 6cm deep, 9cm x 19cm loaf pan. Sift together the gluten free flour, buckwheat flour, baking powder and salt and stir in the sugar. Beat the egg whites until just frothy, and stir in the milk and the vegetable oil. 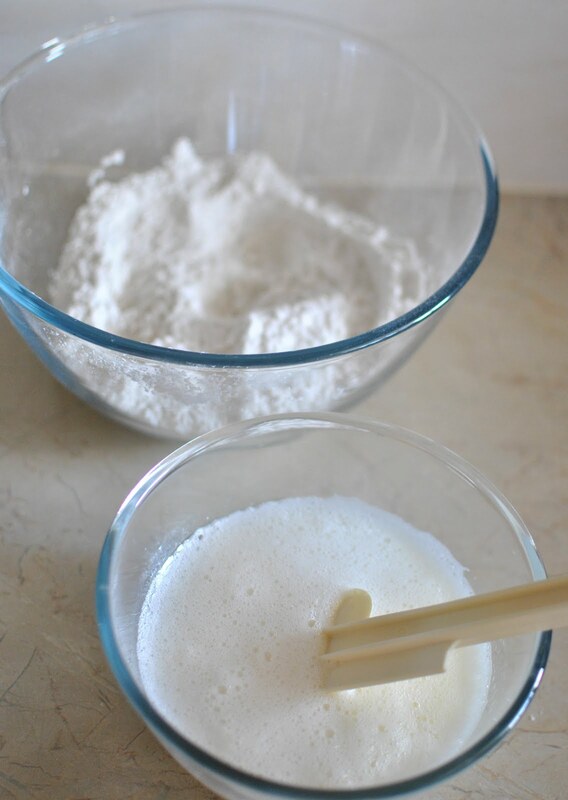 Pour the egg white mixture into the flour mixture and beat for 2 minutes or until smooth. Pour the batter into the pan, and press the seed mix lightly into the batter. Bake for 40-50 minutes or until a skewer inserted in the middle of the bread comes out clean. Et voilà! 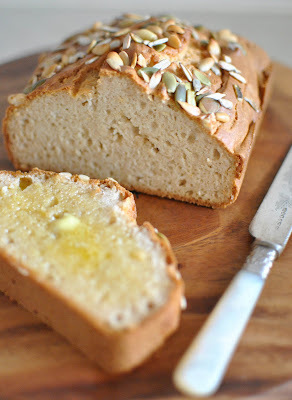 Tasty gluten free bread! Ahhh, it's got eggwhites in it! So that's where the dough would get its 'stretch' from after having no gluten in it? Gorgeous photos Maria! love the Sydney morning light coming through your window, it makes the bread look morning delicious! this looks great. question: there are so many gluten free flours...which one did you choose? I have a friend whose insulin resistant and can not eat most flours. however, buckwheat is on her list. thanks for sharing. looks yummy! The Urban Baker: I used gluten free plain flour by Orgran Natural Foods. Well I had gluten free wheat free banana and cinnamon cake today and it was ANYTHING but bland! My experience is often gluten free bread is very dense and kinda crumbly (not much use for anything really). That bread looks good - appears fairly light while still substantial. Thanks for drawing my attention to this recipe. I'll give it a go for my gluten-free friends. 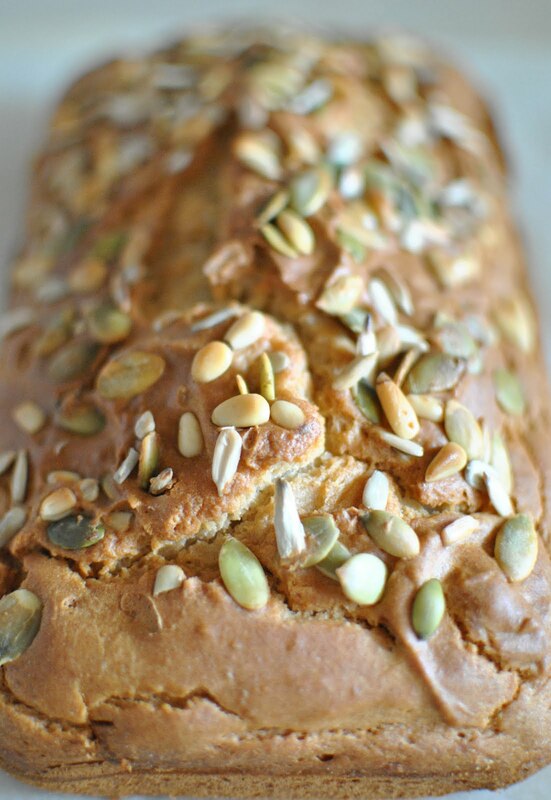 I've never done any gluten free baking, but the idea of gluten free bread sounds really interesting! It's so cool how it looks just the same as normal bread! Hey Maria - Im the first to admit I thought gluten free was boring but you've done a great job to convince me otherwise! What a deliciously healthy looking bread! I don't have to worry about gluten, but even I'd try this version. Indeed, this Gf home made bread looks truly appetizing!! MMMMMMMMM,..I also love taste.com.au They have great recipes! many greetings from Brussels, Belgium,..that land from far, far away! 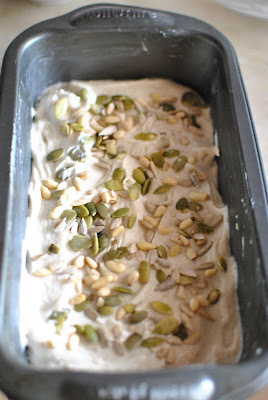 we baked a lot but never used seed mix (pepitas, sunflower seeds, pine nuts) as toppings with our breads. But it look delicious though, thanks for the idea. I use only just the Orgran plain flour and follow the instruction on the back, it didn't turn out so well. Any tips? Maybe you should mix some buckwheat flour in the dough like in the recipe above? It would give it some extra flavour. Hello. Thank you for sharing this recipe! So you find this bread doesn't need guar or xanathan gum? Or is that included in the gluten free flour youre using? Good question! Yes, guar gum was included in the flour that I was using. Thank you so much! So if I am adding it, how much would you recommend? your bread looks good..I noticed you did not use yeast but the bread turned out really good.. Lemon Custard Tart and Happy 1 year!